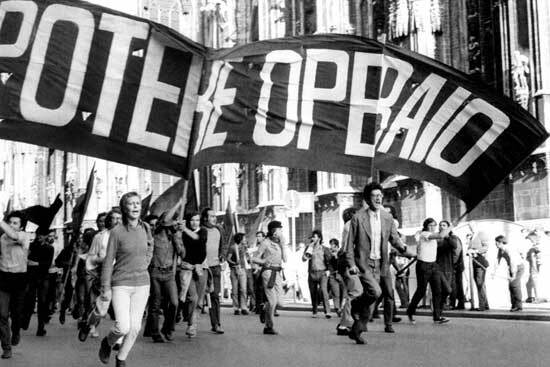 An analysis of the situation in Italy during 1973 by the group, Potere Operaio (Workers' Power). The spiralling working class struggle which has characterised Italian society over the last 6 years has produced a crisis of major proportions for Italian capitalism – the most severe recession since the War. The crisis has not only affected the method of capitalist reproduction, but has also shaken capital’s political control over the working class and has weakened the power of the institutions that mediate the class struggle – the trade unions. Furthermore, it is a crisis that may be very hard to resolve, since at its root lies the main political outcome of a decade of struggles: the workers! generalised refusal of the capitalist organisation of work. ”Chaos”, as the bourgeois press puts it, ”has become an endemic feature of Italian society. The traditional tools of capitalist power are no longer capable of maintaining social peace”. It is during the crisis, says Marx, that the relation between classes becomes clarified. It is by the ”universality of its theatre and the intensity of its actions” that the crisis reveals the unresolvable antagonistic relationship between capital and the working class. The Italian crisis is first of all a crisis of the progressive reformist policies which capital, together with the official working class movement, had started to apply, starting with the first Centre-Left coalition government of 1964. By 1970, following the struggles of 1968-69 it had become apparent that the advanced Keynesian policies promoted by the Centre-Left coalition (economic planning, incomes policy, collaboration with the trade unions) could not contain the impact of a united and politically homogeneous working class struggle. Once again, the autonomous working class demand for more money and less work, for a wage disengaged from the labour expended, hit the capitalist system’s capacity to respond positively and to continue to deliver the goods. As the wage boosts won by workers in 1968 and 1969 easily exceeded the productivity ceiling, the working class struggle for more wages ceased to function as an incentive to capitalist development, and became a threat to capitalist production. Wages could no longer be made to work as ”internal demand”, purchasing power, Keynesian push for development, but, on the contrary, represented a renewed attack on the stability of the capitalist system. The basic Keynesian presupposition that class conflict can be integrated into a strategy of capitalist development revealed once again its political weakness. Capitalism proved to be incapable of satisfying the autonomous and collective needs of the politically re-unified working class. Economic development is second to capital’s need to politically control workers – that is, to maintain a dominant power relation. Where such control over workers has loosened, it must be restored at once. Capitalists, politicians and union executives remind us daily that there will be no economic development until the ”political premises” are there. In other words, there will be no economic development short of a workers’ defeat. (1) Economic crisis; (2) Institutional transformation; and (3) Technological change and reconversion of the economy. The sections that follow deal with these three levels in that order. The role that the official working class movement has played throughout the crisis is also examined. Capitalists do not like crises. During crises, capital’s accumulation slows down and stops. The premise and justification of capitalist civilisation – economic development – must give way to the destruction of capital and of real wealth. Left to themselves, the capitalists would not choose a crisis. The days of crises as a product of intracapitalist competition in a vacuum of workers’ activity are over – if they ever in fact existed. The economic crisis was imposed on the capitalists by the working class struggle. Throughout the 1968-70 cycle of struggles, workers had not only stepped up their mass struggle against work at the point of production through increased strikes, go-slows, absenteeism and sabotage (all activities that do not reproduce capital), but had also expressed their determination to struggle against the capitalist State. Capital was left with a single choice: to accept the crisis as the new battlefield, to try to take it under control, and to make it backfire on the workers. There is one thing we have learned. Crisis is no longer the catastrophic development of capital’s ”social anarchy”, as in the collapse theory of the Second International. Rather, the crisis represents a capitalist attempt to regain control over the workers’ command of the business cycle. In the first months of 1971, industrial production receded an average of 3.5%, with a flat minus-5.1% in the ”leading sectors” – steel, machine tools and construction. Once again, the traditional antagonism between levels of wages and levels of unemployment was exploited. Massive layoffs, expulsion from the labour force of marginal sectors (women, old people, and youth), underemployment, decreased labour mobility – all such means have been used to destroy the unity of the working class, to play off the employed and the unemployed against each other, to separate the community struggle from the struggle at the point of production, to de-compose and to dis-organise the mass worker. Despite these efforts, the wage pressure was sustained throughout 1971. With productivity virtually stagnant, wage boosts averaged a fat 16.6%, and cut deeply into profit margins. By the end of the year, the Bank of Italy revealed that a 670 billion lira increase in the monetary value of production was swallowed by a 1500 billion lira increase in the total wage bill. Capital’s income fell by 830 billion lire. There was no capitalist accumulation in Italy in 1971. Capitalist development depends on current profits as well as estimates of future profits. When the capitalists see no future, they do not invest, no matter how ”easy” money may be. Beyond a certain point of deterioration easy money as such does not get investment moving again. In spite of the ”expansive” fiscal policy pursued by the Bank of Italy, net investments fell by 17% in 1971. It was and is a political strike on investments. If capitalist development represents the basis for a working class offensive, then as far as the capitalists are concerned, the only hope of a workers’ defeat lies in the economic crisis. ”It would be possible to write quite a history of the inventions made since 1830 for the sole purpose of supplying capital with weapons against the revolts of the working class”. Since Marx, and particularly since the development of mass production and the scientific organisation of labour, technological change (called ”progress”) has become a major weapon in the hands of the capitalist class. By actually manipulating class composition technologically, capital has learned how to deal directly with the material existence of the working class as labour power, as mere commodity. In the context of the Italian crisis, the capitalist strategy to base the overall political attack on a ”technological repression” of the working class had to satisfy two fundamental political needs. First, it had to strengthen the attack on jobs, for the purpose of enforcing work on the unemployed. Second, it had to produce major gaps in the homogeneous texture of a working class politically dominated by the collective behaviour of the mass worker; that is, it had to alter the class composition which had served as the basis for the political reunification of the working class in 1968-70. The following measures were attempted: technological innovations that reduce the number of employed workers (technological unemployment); demobilisation of entire productive sectors (such as textiles) and of geographical areas (such as La Spezia); decentralisation of productive structures, so as to eliminate large working class concentrations; restructuring of the labour process in view of two major requirements: (1) a wider range of skillgradings (an attempt at creating a pro-work professional ideology in a portion of the labour force), and (2) widened pay differentials. Once again, the workerst struggle had forced capital to attempt a technological leap. Such technological repression, however, was carried out differently in different sectors of production. In fact, industrial sectors were to be analysed in terms of the instruments they provide for regaining control over the working class. From this point of view, each ”sector plan” represents a particular strategy, a particular model of capital’s command over production. In this respect, the leading sector today is the chemical industry, which, because of its high vertical and horizontal concentration and its integration at the international level, has wide margins of control over the entire cycle of production. Not so for the auto industry. The replacement of the assembly line in the car factories has been on the capitalistst agenda for quite some time, internationally – since the struggles of 1933-37 in the USA unequivocally demonstrated the collective power of the assembly workers, the mass workers. But the ”new way of producing the motor car” is not just around the corner. FIAT’s Agnelli has explicitly ruled out the possibility of any major innovations on, or substitutes for, the assembly line, since this would involve at once huge capital outlays, coupled with a 25% cost increase. Plainly, the big multinational FIAT has become incapable of formulating a workable strategy of containment. At least 360,000 cars have been ”lost” since 1969. The ultimate solution in both the auto and chemical sectors lies in the search for safer areas of investment. Thus, Italy’s South has come to occupy a favoured position in capital’s plan. The new Southern ”poles of development” at Porto Torres and Gela, veritable cathedrals in a desert, testify to a renewed attempt to divide the working class along geographic lines. The political institutions required by a Government which must impose mass repression on the working class cannot be the same as the ones of a reformist government, which would be based on attempted collaboration with the working class. The 1948 Constitution, with its focus on the parliamentary life of mediating political parties and its emphasis on decentralised administrative structures, could not function as the institutional framework for a capitalist use of the crisis. The Italian Republic had been founded on the principle of class collaboration in the name of economic development. Such collaboration remained a dream. Economic development has ceased. Each new Government since the fall of Rumorts Government (Summer 1970) was under pressure to carry out a gradual ”emancipation” of the Cabinet from parliamentary parties and procedure, at the same time that it implemented a general strategy for the repression of the working class. The first few months of the Colombo Government (from Summer 1970 to January 1972) witnessed some uncertainty as to which strategy to employ. Initally Colombo preferred to attack the workers indirectly. A higher sales tax on mass consumer items like petrol, introduced in the Summer of 1970, was the first move of the capitalist offensive. Although a strong measure, it still revealed a major weakness in the capitalist initiative: a certain fear of attacking the workers directly at the point of production, and some hesitation about waging an explicitly political battle. But the continuous industrial struggles of 1971, and the dramatic decline in production that followed, demonstrated that fiscal policy alone would not be enough, that the only way to win in the crisis was direct, open repression. Andreotti’s Centre-Right Government of January to May 1972 was the first Government to openly do away with constitutional bindings, and practice large-scale systematic repression. A modernisation, rationalisation and numerical increase of the police force; a strengthening of executive power, tested through mass anti-crime campaigns (against both ”political” and ”common” criminals); early elections in May (with the Christian Democrats promising stability to the capitalists, law and order to the middle classes, and repression for the proletariat); the assassination of the revolutionary publisher Feltrinelli and the subsequent increase in State terrorism against the mass vanguards and the revolutionary Left; the hundreds of comrades in jail – all of these measures expressed the same political programme: subordinating the needs to resume production and economic development to a process of completely restructuring capitalist command. The May 1972 Elections reflected the radicalisation of the conflict in the only way the elections could offer: a parliamentary polarisation and a growth of votes for the three major opposing parties – the Christian Democrats (DC), the Fascist Party (MSI) and the Communist Party (PCI) at the expense of all other minor parties. The tactical reasons for the working class votes going to the Communist Party should be clear to everyone: the electoral show of strength of the working class as a compact political body should not be mistaken for a show of support for the Partyts political programme. In fact, the Government understood the electoral results for what they were -a show of strength, a threat, and an anticipation – and it quickly stepped up repression after the elections with an eye to the next round of wage-bargaining (Autumn 1972). The winning Christian Democratst political platform did not provide a strategy for economic development – it provided a model for controlling the class. And this was implemented by changing the relationship between trade unions, political parties, and the State. The unions were now told explicitly that their institutional function was to convince the workers to stop fighting – or else bear the burden of continued recession. A wage ceiling was set as a precondition to economic recovery, and strike regulation, though not formally ratified, was accepted in practice by the trade unions, in the form of both ”self discipline” and the search for new mediations to prevent strikes. As for Parliament, political parties became organs of the State, and achieving law and order became a political priority for all. But the major transformation occurred in the role of the State itself. It was the role of the State as a general economic planner that had to come to an end with the crisis. Beginning with the first Centre Left coalition of 1964, capital had come to accept the historic trend towards the re-unification of the working class, and tried to make use of this working class unity in order to re-launch economic development. Through State planning, capital attempted to achieve a general control over the working class as a whole, through the institutions of the democratic State, political parties, and trade unions. But when the mass consensus of the working class could not be secured, working class unity became fully subversive in its impact. Consequently, general planning became impossible, and had to be replaced by different sectoral plans, particular plans for the different sectors of industry, in an attempt to tear major holes in the homogeneous texture of the working class. The impossibility of a general plan and the consequent crisis of the State’s role as general planner meant that business reclaimed the economic initiative and set itself up to manage the crisis directly and to respond to each class situation in a specific manner. The State was left simply with its commitment to the stability of capitalist power. This meant an obvious emphasis on the State’s repressive functions – on institutional violence, the police, the courts, the secret services, and the democratic State’s use of Fascism. price of labour could be determined only by relations of power, open struggle, and by strength of organisation. each other. Capitalism has no margins for reforms and economic development, and the Communist Party has been in no position to guarantee control over workers’ behaviour. But then what has the Party had to offer to the working class? Only an anachronistic, ideological re-posing of ”reforms” (such as public expenditure, and rationalisation of the ”social services”) and a campaign for a democratic struggle against Fascism which would include all the parties that accept Parliamentary fair play (with the single exception of the Fascists themselves). In the CP analysis, the threat of a Fascist take-over would be dispelled by a popular-front coalition. A few words of explanation: the CP’s alarmism notwithstanding, Italy is not presently on the verge of a Fascist take-over. True, after the failure of reformism, capitalist strategy has come to a political crisis, for it has not indicated a way to utilise productive forces in a way which is adequate to match the growth and autonomy of the working class. The Fascist solution, however, when applied to the problem that capitalist strategy must tackle today – containment and utilisation of workers’ struggles at the highest level of socialisation – is but a museum piece. A popular front in defence of bourgeois civil liberties is not a rearguard solution: it is simply a solution for a problem that does not exist. The problem today is not that there is a possibility of a Fascist takeover; it is collective capital’s support of, and the democratic State’s use of, Fascism. For capital Fascist thugs are instruments of direct, physical repression in the unions, on the picket lines, in the streets. Their existence in the political arena, moreover, allows the State to play the role of mediator between ”opposing extremisms” – revolution and reaction. But who are the Fascists? That is, whose interests do Fascist interests represent today? They express the interests of the most backward fringes of capital: small business – a social stratum that is doomed to collapse, haunted by the rising cost of labour, and that is progressively squeezed out of existence by the sharpening class struggle. The political strength of the Fascists, therefore, derives not from the stratum they represent (a fragile stratum indeed), but from the function they are called on to fulfil as a weapon of the democratic State in the anti-working class offensive. Under these conditions, to ”denounce Fascism” and at the same time to ”defend the democratic institutions”, as the CP anti-Fascist campaign would, is not simply political blindness; it is open collusion with capital in the attempt to disarm the working class. The crisis of reformism has deeply affected the role played by the unions in the capitalist plan. Years of open, autonomous struggle have made it clear that the unions cannot guarantee the collaboration of the working class. In fact, the formal signing of labour contracts has seldom put an end to industrial struggles. Capital has come to realise that collaboration with the trade unions makes little sense when it does not ensure the collaboration of the working class. Furthermore, on certain occasions during the early years of the cycle, the trade unions, far from exercising control, have been used by the workers as one means of coordinating their struggle. Clearly the unions in the ”Keynesian” State of the 1960s could fulfil their political function of mediation and containment only on the condition that they effectively ”represented” the working class – that is, on the condition that they accepted (and mediated) its spontaneous struggles. Hence, we witnessed a ”radicalisation” of the unions’ official platform of demands in 1968-69, as well as the emergence of a Left wing within the trade union movement. The unions’ strategy focussed on one major objective: to contain the workers’ struggles through the paradoxical argument that one must stop striking in order to prevent anti-strike legislation. But the history of the last several months has dispelled any illusions concerning the possibility of trade union control over the working class. Once again it has been the struggle of the auto and metal workers which has functioned as the occasion for the new major working class offensive of Spring 1973. Once again, the situation at FIAT epitomises the political features of a whole wave of struggle. Since the Turin general strike of September 1972, the struggle has grown out of control in terms of both violence and generalisation. Throughout the Autumn, the FIAT workers stepped up their cortei interni (insidethe-factory militant marches that proceed from shop to shop, busting doors and gates and sweeping away foremen, strike breakers and guards). On January 22nd, the Lancia car workers launched a sit-down, and battled with the police when the latter tried to enter the factory. (One worker was killed by the police). On January 26th, striking students joined picket lines and workerst marches in Milan. (One student was severely injured by the police). On February 2nd, some 20,000 FIAT workers staged a one-day occupation of the FIAT-Mirafiori plant, which triggered a wave of factory occupations in the following months. By February 9th, nearly half a million workers had congregated in Rome for the largest working class demonstration to take ,place since World War II. Their slogans were ”Power to the Workers” and ”Factory, School, Community – Our Struggle is for Power”. Together with the cortei interni, mass absenteeism has become a major new form of struggle. Once again, FIAT workers have led the way with an absenteeism rate of 28%. This means that each day 30,000 FIAT workers do not go to be exploited by the capitalist factory; that the average real work-week at FIAT has been self-reduced by workers to a little over 30 hours. Through their absenteeism and sick leaves, the 100,000 FIAT workers of Turin have re-appropriated 45 billion lira (over £3,000,000) – nine times the net profit that FIAT posted for 1972 – without work. And absenteeism, far from being a substitute for other forms of struggle, has been growing together with other forms of workerst revolt – strikes, picket lines, factory occupations and mass demonstrations. On Thursday March 29th, FIAT-Mirafiori was occupied again. Early in the morning, a crowd of 10,000 picketers blocked all the entrances. To the workerst slogan ”Occupy FIAT – No Truce”, the unions responded with their own ”Strike for Two Hours”. Inside the occupied factory workers set up permanent political assemblies. FIAT’s first move was to threaten not to distribute the weekly wage packets, and to call the police. Friday morning, however, wage packets were ready as usual – but for strikers only. ”Workers’ Courts” ruled that strike breakers would not be allowed to pick up their wages. In the Body Plant, the workers held a mass trial of foremen and scabs. By Friday evening, most of Turin’s factories were in the hands of workers: cortei, assemblies and occupations started at Lingotto, Bertone, Pininfarina, Spa Stura, Ricambi, Lancia, Carello, Spa Centro, Ferriere, Grandi Motori and others. Picket lines at hundreds of factories throughout the Turin area guaranteed that if the clash exploded, it would not blow up only Corso Traiano, as in 1969, but would blow up the entire city. Avoiding a battle was a major necessity for capitalists, unions and government alike. On Monday afternoon it became known that the bosses and the unions had signed the new engineering workers’ contract. The new national contract was no workers’ victory, for two reasons: First, it incorporated very little of the workers’ own material demands. Second, and more important, as a result of bargaining between capitalists and unions, the contract did not and could not reflect the political strength and militancy that the working class expressed throughout the crisis. The disparity between the political strength of the workers and the results that their strength can command at the level of bargaining is obvious. On Tuesday morning the unions pushed for an end to the blockade. Union officials and foremen together urged the workers to go back to work, and managed to get a few shops working. But on the whole, production did not resume. The first back-to-work day was again a day of no production. At Mirafiori, 60% of the workforce was ”absent”. Thousands of workers resumed picketing and blocking production. At Rivalta, the workers’ assembly expressed the will to continue their struggle until all the people who had been fired during the strike were re-hired. This demand for re-hiring those fired may trigger a new post-contract workers’ offensive in the months ahead. As we are writing, the situation remains unstable and open. What, then, is the main political characteristic of this wave of struggles? It is the way that workers have used the struggle over the contract as simply a moment in the general confrontation between capital and the working class. Here we must learn a lesson of working class strategy: throughout the struggle the workers have left all bargaining in the hands of the unions, and have shown little interest in the official platform, realising that no union platform can defend the workers from the capitalist attack. They have concentrated on fighting the capitalists on a more advanced level -that is, fighting them over the capitalists’ own demands. In fact, the motor-industry and metal-industry capitalists, with Agnelli leading the way, came to the bargaining table with their own explicit demands: and end to ”permanent conflict”; regulation of absenteeism; no reduction in the working week; full utilisation of productive capacity. Precisely these demands were rejected by the struggle at FIAT. After the contracts were signed, the ”permanent conflict” did not subside, absenteeism was not reduced, discipline was hardly restored, and production was only resumed with great difficulty. Signing the contract did not put an end to the struggles, for the workers’ struggle has been beyond contracts all along.